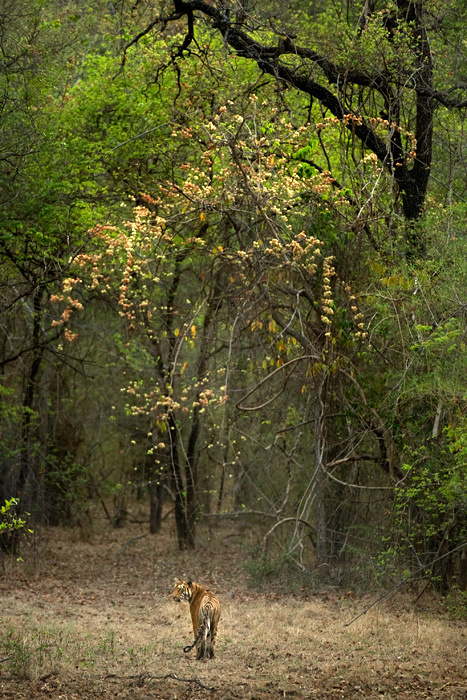 Today marks a month since we have been filming in Tadoba Andheri Tiger Reserve in Central India. Filming has been relatively slow, but as the summer picks up, we are hoping the sightings of wildlife would too. The colors of the forests during summer in unbelievable. Great picture ! Have been a big fan of tadoba. What a lovely image! Stunning! Kalyan that image so perfectly captures the Tadoba I have spent the last two decades of my life protecting. Thank you. Great capture…Goodluck for ur venture in Tadoba…Cheers! Wish you many more sightings over there ……All the best !!! wow to say the least… you have got some wonderful perspectives of shooting, kudos! This image comes close to what we experience without a camera! Beatiful image!! Awesome Shot ,as always from you.Wishing you all the luck in the days to come. Great shot of the mighty animal in its natural environment. We happened to be in Tadoba-Andhari last week. Saw your filming crew on the morning of the 29th April, when a leopard was sighted. Were you able to get good pictures of the leopard? If so, will you upload them here? Thanks! It was a pleasure running in to at the Tadoba gates Kalyan. I had an excellent sighting at Yen bodi, but your pic just takes the cake and icing along with it! I saw your filming crew in tadoba when a leopard was sighted do you have any close ups of a tiger? if so will u please upload it? Great!! To see the tiger in the natural surroundings.We have worked in the forest of Maharashtra for four decades and feel proud for there natural beauty of flora and fauna. I has been great meeting you during the drives in Tadoba. Wish you Godspeed. I’ve Been To Tadoba.Some Places are absolutely amazing. This Is Just an awesome Click! Charan Jatthana whose father and I were colleagues at UTC , Banglore, has asked me to ask your permission to paint your pics of tigers, if I may.I am painting to raise funds for a charity called Cure International and Cure Clubfoot Karnataka. I am a retired English professor and am 70!..and love tigers and all wildlife! I will acknowledge my debt to you. just love the forests that you have photographed..
Lovely habitat shot and great composition. Had the privilege of visiting and photographing tigers in this wonderful park. Is it Katezeri area? SIR,trust this finds you on the tail of a tiger.I have just seen your monochrome shots of MASAI MARA,they were just stunning. Even in this world of colour your photographs have created great impact.I happen to be an amature photographer , constantly trying to improve my photographing techniques .I seriously think i saw you in GIR NATIONAL PARK PHOTOGRAPHING A BIG MALE LION who was sitting just outside a bush .This was in the 1st week of MARCH 2012.PLEASE CONFIRM . In case you are from BANGLORE i would surely like to meet you,in case you are free.I will be in BANGLORE from 1o— 17th march2012.My mobile no is -9336216447- 9559212121. Great fillings of the forest. Nice picture. You must visit Tadoba wildlife sanctuary once in your life. This is a beautiful place where you can feel the beauty of nature. That precise moment is captured when the tiger has turned his head a little bit. Conveys the mood of the surroundings to the viewer. Great shot.